Remember the roots! Most of a tree’s roots are in the top 8 inches of soil. 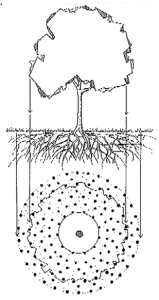 Excavation, trenching, and grading can damage roots and kill a mature trees. 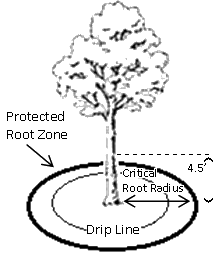 Avoid any soil disturbance, contamination and compaction in the “Critical Root Zone” defined as a circle with 1.5 feet of radius for every inch of trunk diameter at 4.5 feet above the ground. damage, retains moisture and looks good too. A 3 foot radius or more is preferred but never mulch more than 3 inches deep and don’t allow much to touch the trunk. Water your trees. Yes, mature trees DO need water, especially in times of drought. Water infrequently but deeply by placing a slow running hose on the ground. A few dollars more on your monthly water bill is cheaper than removing a tree if it dies. Employ a certified arborist to identify and remove dead or diseased limbs. These can fall and be a risk to you and your property. In general, a mature tree should be inspected every 3 years. rtilize your tree, use growth regulators, perform core aeration, or use an air tool that “tills” in organic amendments, such as composts and biochars, without harming the roots. Beware of the “fungus among us”. Many fungi (mushrooms) in the soil are beneficial, but when you see them growing out of a trunk or branch they’re a sign of decay and you should contact an arborist to inspect the situation. Give your tree a check up. ISA Certified Arborists, members of the American Society of Consulting Arborists, and arborists with the ISA Tree Risk Assessment Qualification all understand mature tree health, physiology, and structure and are great partners in caring for your valuable asset.